A historic global collaboration, with contributions by a Waterloo physicist, has lifted the veil on a cosmic mystery by proving the existence of black holes. 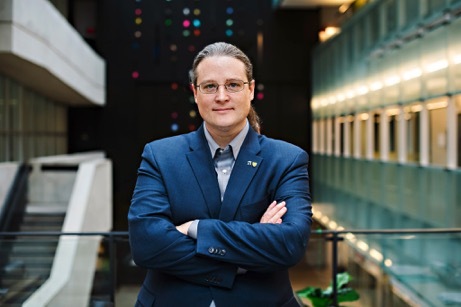 Avery Broderick, a professor at the University of Waterloo and an associate faculty member at Perimeter Institute for Theoretical Physics, and his group played a key role in helping the Event Horizon Telescope (EHT) Collaboration interpret the historic images. Broderick also previously developed theoretical models that accurately predicted what the images would look like. “The EHT is a culmination of almost two decades of effort by a global team,” said Broderick, who also holds the Delaney Family John Archibald Wheeler Chair at Perimeter. “Once you’ve invested that sort of time, it’s a deep feeling of satisfaction that, finally, we have in hand this quarry we’ve been chasing for so long. The EHT — a planet-scale array of eight ground-based radio telescopes forged through international collaboration — was designed to capture images of a black hole. 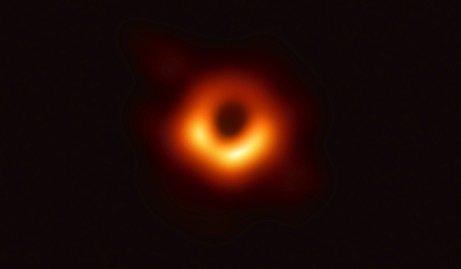 Today, in coordinated press conferences across the globe, EHT researchers reveal that they have succeeded, unveiling the first direct visual evidence of a supermassive black hole and its shadow. Broderick, who developed the first theoretical models that correctly predicted what the EHT would see, is now working with his colleagues to exploit the observations to reveal a new understanding about how these behemoths work. While this first image may appear to agree with Einstein’s theories and be a wonderful validation of event horizon simulations, Broderick emphasized that further investigations and more observations of other supermassive black holes may turn up some surprises. The majority of galaxies are thought to contain supermassive black holes in their cores, including our galaxy, the Milky Way. M87’s black hole was chosen as the first black hole to be imaged as, though it is 2,000 times further away than the black hole in the centre of our galaxy (called Sagittarius A*, or Sgr A* for short), counterintuitively M87 is easier for the EHT to see. Observations of Sgr A* are ongoing, and other supermassive black holes in our local universe will be identified as possible EHT candidates. The EHT will also be regularly checking back on M87 and Sgr A* to see how they change over time, as both are very dynamic and very interesting black hole targets. “Now we have the opportunity to do all of those things that we’ve been dreaming of,” Broderick concluded. “For me, this first image represents the end of the development phase. There are so many things we’ve been hoping to investigate, and now we have a window into the universe that can help us do those things using real observational data.